We are all trying to simplify our lives. I don’t know about you, but I’ve never had a busier time. 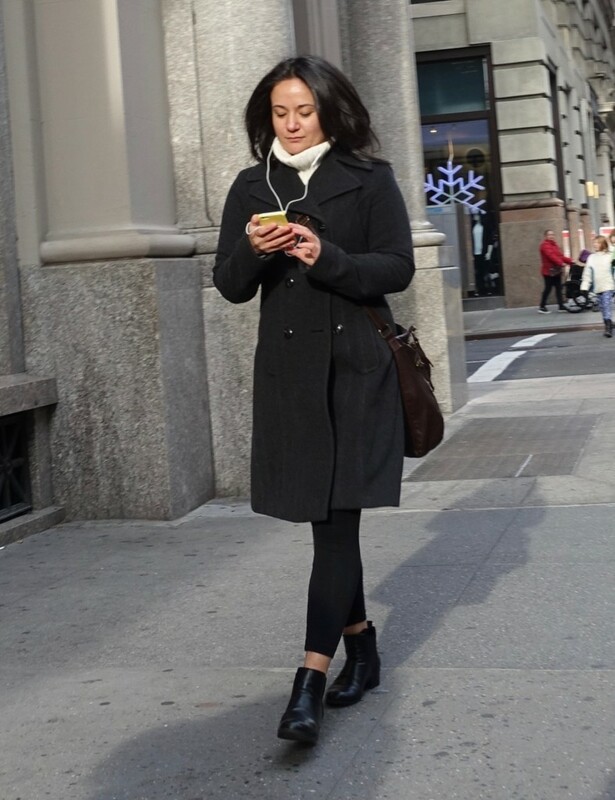 I owe a lot of that to the blog; when I’m not writing a post (or freelance interpreting in the courts), I’m photographing street style, tweeting, instagramming, or some other such activity. Don’t get me wrong: I totally love this! But I don’t exactly have free time anymore for my favorite forms of lallygagging like bingeing on YouTube videos about styling fine hair. And so, when I think of a simpler way to dress chicly, I’m all over it. That’s where all-black dressing comes in. On my last New York photo shoot, I wore all black. I had brunch that day with Liliya, who made a strong case for brilliant color. Now I might have felt chic in my all-black, supposedly slimming ensemble, but in our photos, I noticed…well, I didn’t exactly pull it off. While I was getting dressed that morning, I felt safe with the simple approach of wearing black on black. The end result in photos, however, was a bulky-looking outfit that was well, boring. 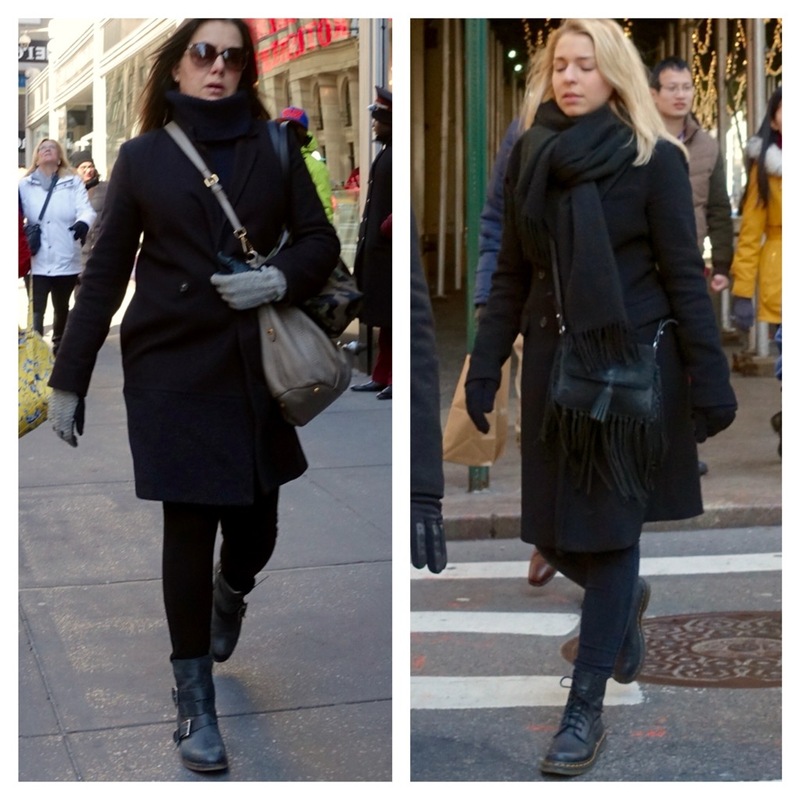 During my street style photo shoot, I noticed some great all-black outfits. And upon later reflection, figured out 7 reasons why these outfits work so well. 1 – Even though black is generally slimming, it seriously helps to wear fitted clothing – especially in winter when fabrics are heavier. A red lip is also a classic touch! 2 – All-black clothing can look monotonous, but certainly not when your outfit features an unusual and interestingly cut (or shaped) garment. 3 – Cool accessories are another huge boost, like for example, Javi’s edgy Ramy Brook handbag – black seems to generally be the most successful hue with an all-black outfit – and her gorgeous Prada shades. 4 – When I looked at Liliya’s and my photo on the day of this shoot, I was mortified upon noticing that my skinny black pants were bunched up a bit just above my ankle boots. More fitted skinny pants – without bagging! – look cool – clean and slightly edgy – tucked into a moto boot. You might recall Liliya’s version in a previous post. 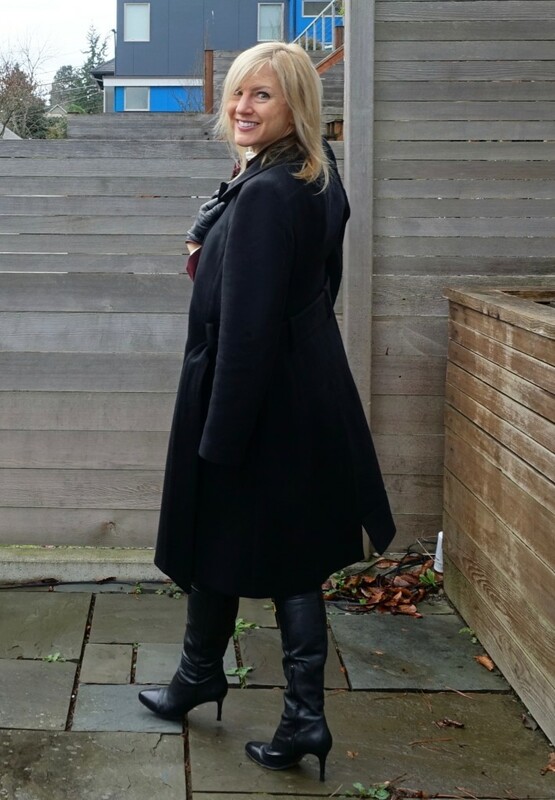 This seriously works: a coat with an interesting hemline and skinny pants tucked into moto boots. Check! Check! 5 – Another way to add interest to an all-black ensemble is to mix it up when it comes to texture. Notice how lovely a semi-sheer skirt looks below a thick wool coat. The flowing fabric is also a nice contrast with heavy, clunky footwear. Although the other photos in this post are from New York, I had to include this one I took in Boston (Newbury Street). 6 – A shot of white or pop of color is a refreshing accent to otherwise all black. You might remember this lovely young woman from our post about scarf tricks. Love her textures! 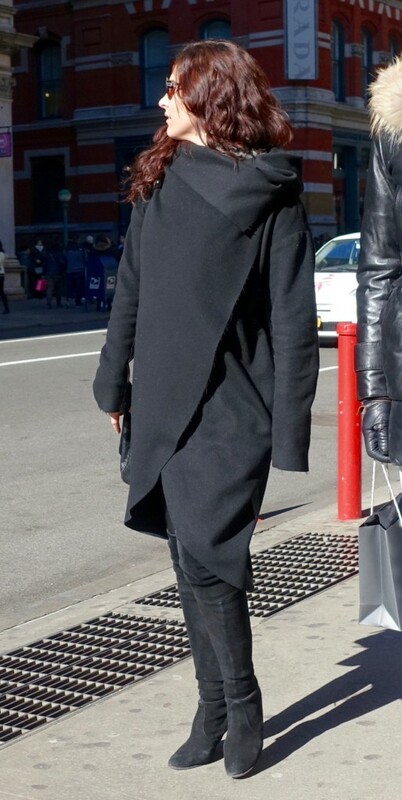 7 – When your all-black outfit includes a dress, a belted coat makes for a beautiful silhouette. And with tall boots, black tights ensure a continuous (read: flattering) line. A limited palette doesn’t have to be limiting. One of the best ways I’ve found of keeping an all-black ensemble interesting is to mix up shapes and textures or add a cool accent or two. There’s so much potential for chicness! And if you follow at least one of these suggestions, it’s quite simple really. Do you have any other tricks for wearing all black? I’d love to hear them! Total black is always a good idea!!! Grazie, Paola! Happy Friday! Janea ???? Hi Janea… Since black is most definitely my happy color (aka I wear too many black clothes) I truly appreciate this post. We should get together and do a challenge on the various ways to make black more interesting since I won’t be giving it up anytime soon. Thanks for sharing this fab post.